It turns out that Red Skull’s appearance in Avengers: Infinity War almost had a drastically creepier design for the Captain America foe. 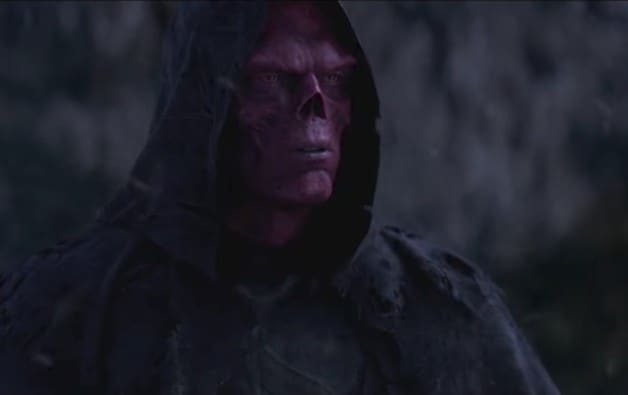 Earlier this year, Red Skull made a surprise appearance in Avengers: Infinity War played by actor Ross Marquand, who took over the role from Captain America: The First Avenger‘s Hugo Weaving. The villain’s return was always talked about amongst fans whenever a major Marvel movie had been on the horizon due to his ambiguous exit from the first Captain America film. During the pre-production process on these films, heroes go through many different costume design changes and now new concept art reveals that Red Skull was no exception. Fans can now take a look at some alternate designs for Red Skull that were considered but ignored in favor of the one that millions of fans saw on the big screen this past summer. The design in the film is very similar to the character’s first Marvel Cinematic Universe appearance but more worn and tattered. Check out the post below to see some alternate designs for the character that appear to be much more grotesque than the one in the final cut. While those designs are all intriguing, it was probably better to go with the design pictured at the top of this article to more closely match the original look for excited fans, as opposed to over-thinking and over-designing a character who is essentially a cameo in a huge, two-and-a-half hour superhero epic. We’ll be sure to keep you updated on all news regarding Avengers: Infinity War and the entire Marvel Cinematic Universe as soon as more information becomes available. Were you happy to see the iconic Captain America foe’s return in Avengers: Infinity War? Which alternate design do you prefer? Let us know your thoughts in the comments below!